Dørfallet is a nice waterfall near Venabu in the municipality Ringebu/Oppland. The river Døra drops down over 80 meters in one drop. 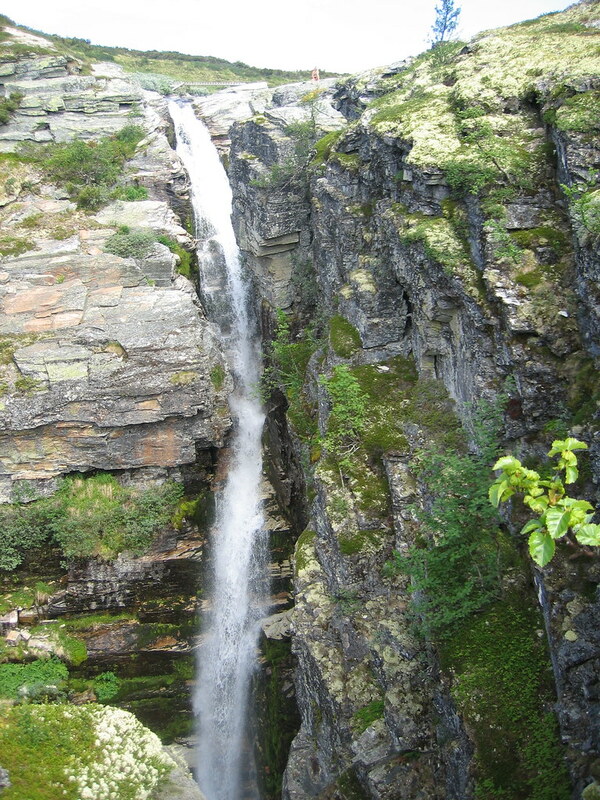 Dørfallet is a waterfall that folds down into the canyon Dørjuvet. This is a spectacular spot on this relatively flat Venabygd mountain. Døra can be found east of Venabu. When driving on road E6 near Ringebu you have to take road 27 (Rondevegen) towards Venabu. At Venabufjellet hotel there is a trail (3 km/60 minutes to Myafossen) going to Myaseter>Mytunga>Bjønndal and then to the Myafossen or Døra. The trail is well signed but can be very steep at the end when descending to th ebase of the Myafossen. Dørfallet is nearby: on the way to Myfallet you already passed the sign for Dørfallet. From the upper viewpoint at Myfossen it is a 70 minute walk to Dørfallet. In total the walk to both falls will take about 5-6 hours.